It’s another Monday, so to start our week right, let’s get ourselves updated with the latest news in the world of mobile devices. It’s another Monday, so to start our week right, let’s get ourselves updated with the latest news in the world of mobile devices. This week, let’s talk about the upcoming update for Windows Phone devices, a leaked image of a new iPhone and BlackBerry’s latest financial reports. A Windows Phone update will reportedly be coming to Nokia handsets this August and will bring a number of new features to the Finnish company’s Lumia smartphones. The news comes from Nokia Spain’s Twitter page which says that the Amber update for Nokia Lumia range with WP8 will arrive in August giving the phones the same user interface as the Lumia 925. Some of the features that will go in the update include Nokia’s Smart Camera Lens, activation of FM radio receivers (except in Lumia 620), and the “double tap to wake” lockscreen. BlackBerry’s quarterly financial reports are now out and it appears that the Canadian smartphone manufacturer is doing well in terms of sales of its BB OS 10 devices as it was able to increase shipments by 800,000 units compared to last quarter. Also, the company’s revenue was also up by $3.1 billion with increased revenues in North America, Asia and the Pacific and Europe. However, the company suffered some losses to. At the end of the quarter, Blackbery incurred an operating loss of $84 million and its revenue in Latin America dropped by 6%. According to BlackBerry’s forecasts, they’re expecting to lose more money over the next quarter but says they will continue with their cost cutting efforts and focus on their core products which includes BlackBerry OS 10, Enterprise Service 10 and BlackBerry Messenger. Rumours about a more affordable iPhone have been circling the internet for quite some time now, but it was only a few days ago that these rumours were somehow substantiated as leaked images of the purported plastic iPhone leaked online. The images were uploaded by a blogger who is known to having connections with factory workers in Apple’s Chinese manufacturing facility. 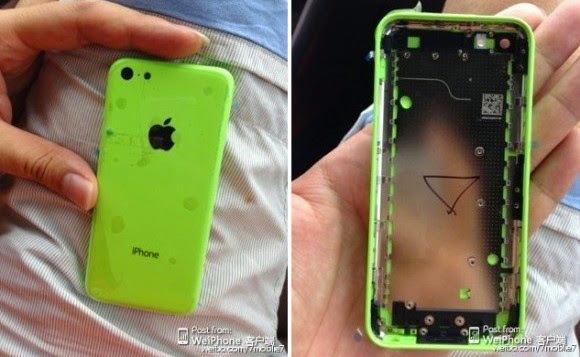 The images show the back cover of the phone in bright green colour which supports earlier reports that the new iPhone will be offered in different colour options. The camera, as well as the single LED flash is also seen on the leaked photos. Previous Post Google Developing Own Gaming Console, Smartwatch, etc.